High-growth technology and dividends don’t always go hand-in-hand, but Ubiquiti Networks is unique. Dividends are sometimes a controversial subject for investors. That's especially true of tech companies, where competition is fierce, the growth imperative is strong, and the threat of technology changes are always a possibility. Dividends often just don't seem like a smart way to spend money for tech companies. Steve Jobs was famously averse to dividends at Apple. New CEO Tim Cook reinitiated a dividend in 2012 -- after a 17-year hiatus -- amid activist pressure. Of course, the decision to pay a dividend perhaps becomes easier if you own a controlling interest in the company, as Ubiquiti Networks (NASDAQ:UBNT) CEO Robert Pera does. As part of its last earnings release, the company announced it would begin paying a dividend, the first regular dividend in the company's history. It's another milestone for the company, which has been on a great run ever since 2016 -- though not without a few bumps along the way. Ubiquiti Networks is rewarding patient shareholders. Image source: Getty Images. Ubqiuiti announced a quarterly per-share dividend of $0.25, with the ex-dividend date on Friday, Aug. 31, and the payment date on Sept. 10. The company plans to pay a regular dividend, meaning this will not be a one-time event. Ubiquiti has paid out two one-time dividends in its corporate life, an $0.18 dividend in 2012 shortly after going public, and another $0.17 dividend in late 2014. A $1.00 annual payment comes to a roughly 1.2% dividend yield at current prices, which is not too shabby. Can the company afford it? Some may wonder if Ubiquiti should be paying out cash, as the networking company sets its sights on competing with tech behemoths Cisco and HP Enterprise. However, Ubiquiti has the good fortune of being the rare high-growth business that's also highly profitable. Ubiquiti accomplishes this by investing extremely little in selling, general, and administrative costs, relying instead on the power of the internet to virally spread product information, execute product support, and recruit beta testers through its large online community. Pera, a former Apple engineer, emphasizes R&D to make high-quality products at low prices, believing they will essentially sell themselves to the company's entrepreneurial customers online and through third-party channels. The model seems to be working. Last quarter, Ubiquiti reported 18% revenue growth, 34.7% non-GAAP EPS growth, with 32.7% operating margins. Net cash swelled to roughly $206 million, with $666.7 million in cash and $460.4 million in long-term debt. That pristine balance sheet is even more impressive considering the company spent $445 million on share repurchases over the past year, retiring 7.2 milllion shares -- almost 10% of its market capitalization. Managment forecasts $4.00-$4.80 non-GAAP earnings per share for the current fiscal year, meaning the dividend would amount to only a 25% payout ratio at the low end, which gives it plenty of room to pay that dividend. Ubiquiti's unique business model has been controversial. It was the target of short-seller Citron Research last September, which went so far as to call the company a "fraud." (Short-sellers bet against a stock and make money when it falls.) In February, the SEC asked Ubiquiti for information regarding "a range of topics," including the company's accounting and relationships with third-party distributors. The company said it intended to cooperate fully with the SEC. Ubiquiti had some good fortune when the 2017 tax law changes allowed it to repatriate its large international cash holdings at a lower tax rate. That not only allowed the company to fund large share repurchases, but also seemed to prove its cash balances -- and therefore its business -- were indeed real. The company also just filed its annual report, which was audited by KPMG, one of the "big four" auditors. 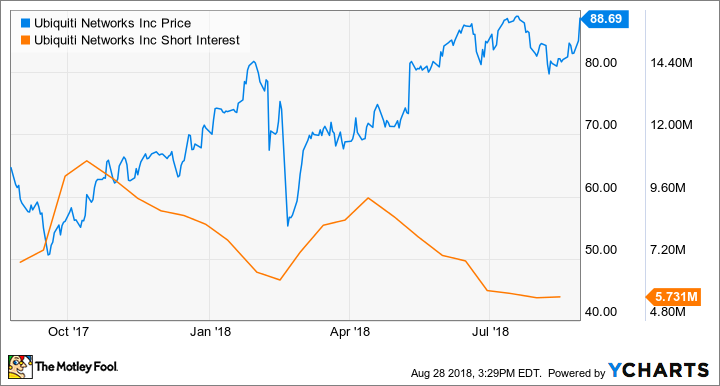 In the past few months, it appears the market has gotten the message, as short-interest sharply declined. Since the repatriation announcement in May, Ubiquiti's stock has been on a steady rise. Once the stock cleared $80 in May, management seems to have halted repurchases, in favor of initiating the dividend. Data source: Uniquiti Networks annual report. What does the dividend mean? Some may wonder if the dividend signals the company's high-growth days are over, or if management now thinks the stock is fairly valued. I don't think that's necessarily the case. The high end of the company's guidance implies 30% non-GAAP EPS growth. In addition, Ubiquiti's stock has traditionally been highly volatile due to its low public float, and management has taken advantage of this with aggressive repurchases during dips. In other words, management is likely aware of the stock's volatile trading history, and with the stock currently near all-time highs, is likely trying to be disciplined in repurchasing shares. Ubiquiti still has over $300 million on its current repurchase authorization. For tech companies, dividends should probably be last on the list of allocation priorities, but Ubiquiti just generates too much cash, and isn't finding enough high-return places to invest. As far as corporate problems go, it's a good one to have. Could Amazon's Latest Acquisition Hurt Ubiquiti Networks? Ubiquiti Networks Surges After Reporting Q2 Results. Time to Buy?